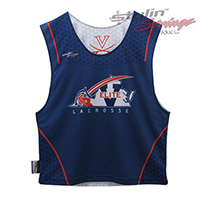 The Virginia Elite sublimated lacrosse reversible was designed for personel of the UVA lacrosse team that run the club. A custom logo in the shape of virginia with a sword coming out of it brands the front. A custom body line hugs the neck and shoulders with a ghosted sabres pattern. The Virginia V sabres logo is on the top back of the pinny. We color matched the fabric almost identical to the University colors.